It is becoming increasingly clear that Governor Akinwumi Ambode no longer has a shelter in the APC in Lagos, with regards to his second term bid. Either direct or indirect primary, the entire structure of the party which is controlled by Bola Tinubu have endorsed his rival. There's nothing left, Babajide Sanwo-Olu is the anointed one. No fewer than 377 ward chairmen of the APC in Lagos State have endorsed Sanwo-Olu for the governorship ticket. They announced their support for the former Establishment & Training Commissioner ahead of next Saturday’s primary election. 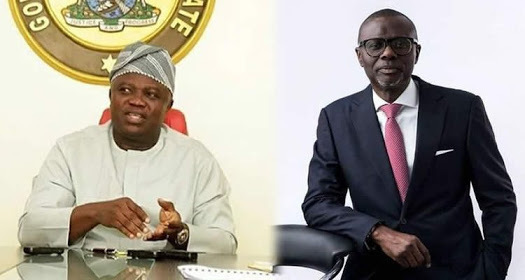 At a meeting involving Sanwo-Olu, some party leaders and the grassroots mobilisers at Martino’s Hall, Ikeja, the chairmen, under the auspices of Conference of Ward Chairmen, promised to ensure Sanwo-Olu’s victory on Saturday. Shola Oshobajo, who spoke for the chairmen, assured Sanwo-Olu of his members’ support before, during and after the primary election. The Director-General of the Babajide Sanwo-Olu Campaign Organisation (BOSCO), Mr. Tayo Ayinde, described Sanwo-Olu as a party man, who will not abandon the party and its members if elected the governor. He enjoined the conference members to mobilise all party men and women in their individual wards to come out in large numbers and vote for Sanwo-Olu as the APC candidate. Sanwo-Olu thanked them for the confidence reposed in him and promised not to disappoint them if he gets to power. Sources say Ambode is weighing his options, and if he eventually decides to make the big move it will be to either PDP, SDP or ADC.